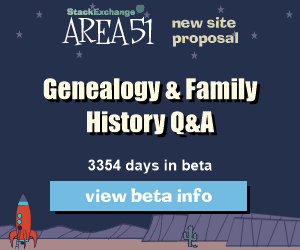 Over on StackExchange, there is an Area51 proposal for an Genealogy and Family History Q&A sub-site… but for this to succeed, it needs the support of the genealogy community. Stack Exchange is a fast-growing network of question and answer sites on diverse topics from software programming to cooking to photography and gaming. It builds libraries of high-quality questions and answers, focused on the most important topics in each area of expertise. From the core of Q&A, to community blogs and real-time chat, it provide experts with the tools they need to make The Internet a better place. This entry was posted in FamilyTree. Bookmark the permalink.